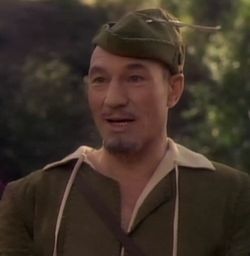 The Prime Directive requires Starfleet personnel to dress up in the absurd local garb and hope that everyone will ignore the fact that they speak English with an accent the locals will never have heard before. 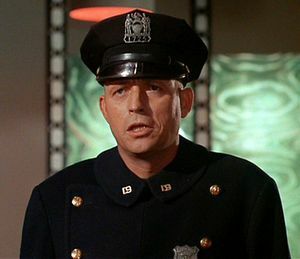 The Prime Directive, in Star Trek, was a galaxy-wide order that Federation members not interfere in the culture of the planets that they visited. For example, on encountering seemingly human residents who speak English, conducting ravaging chemical warfare over an obvious case of mistaken identity, the Prime Directive orders Federation members to just let them fight it out and see who wins. Who are we to know better, really? Coexist. The Prime Directive is an obvious case of lawyers dictating that strangers engage in absurd actions so that the lawyers can feel good about themselves. 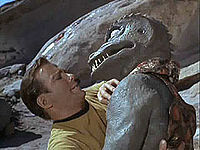 Its purpose is to reassure Star Trek viewers that the future will be comfortably similar to the present. No identification of self or mission. No interference with the social development of said planet. No references to space, other worlds, or advanced civilizations. It is not stated what "said" planet is, but we assume it is the planet they are on. The most important point is also omitted: No references to television or cinema. No discussion of the multitude of cameras, the scaffolding, the people sitting in one direction looking at the aliens, or indeed why their reality seems to end just in front of them and all their starships and space stations are cut wide open on one side without all the air rushing out. Also, no mention of re-takes: of why everyone conducts the same dialogue six times, the last time getting their lines right. But this is never a problem. You got a permit for that toy ray gun? "No identification of self" is always problematic, especially since crew members (having no foreign cash, and most planets not being in the Eurozone), are usually faced with the need to steal clothing to replace their Starfleet uniforms, also hats and occasionally veils to cover up those nagging alien-species ears and foreheads, which typically puts them in direct contact with policemen, at which time, refusing to identify yourself and quoting a snippet of unknown law is not the best ice-breaker. More to the point, we never find out why dozens of species spent tons of money building starships to contact alien civilizations, which might do some things better than we do, if we are prohibited from telling them that we do a couple things better than they do; nor why they would otherwise spill their technological beans for free. For those without comedic tastes, the self-proclaimed experts at Wikipedia think they have an article about Prime Directive. On the stealing-clothing thing, you can violate the Prime Directive with impunity if it's really important. Off-world cultures are assumed to all have thieves of their own, so a couple new thieves wouldn't really be disclosing anything. You can violate the Prime Directive with relish if the Klingons did so first. Obviously. When seducing an alien, one must first determine if the alien is from a "pre-warp" society. There are special rules for fast chicks. Alien civilizations that are obviously in a state of arrested development can of course be interfered with. For example, if the Federation encounters an alien culture that still smokes, uses money, uses disparaging terms about aliens with skin color resembling African Americans, or eats meat, the Federation can send hundreds of social workers to restore the planet to normal development. Federation starships encounter numerous planets where society is under the control of a single computer that is obviously malfunctioning and needs a human repairman to come and shut it down. Eventually Starfleet officers started to make a distinction for "pre-warp" societies. Societies that had learned about faster-than-light travel would be recruited to join the Federation and contribute to its awesome navel-gazing and analysis-paralysis. They might even contribute to the evolution of the Prime Directive, and would surely not say it is a piece of crap. The other riff-raff would be made available for study by doctoral candidates in anthropology and social work. By rule, Captain Kirk can always violate the Prime Directive to win the heart of a comely alien female (pictured) with whom he is contemplating a one-episode stand. It can be considered another gaping hole in the Prime Directive that Starfleet has never, ever administered even a rhetorical slap-on-the-wrist for any space crewperson who violates it. The Prime Directive plays a key role in the list of overused episode plots.